In a nifty article in The Mary Sue, Nicole Kimberling reminds us why we still need feminist science fiction — and the different forms it can take. Nicole goes on to explore the whole question of how a non-political story can be “feminist,” with lots of quotes from the other authors in the bundle. 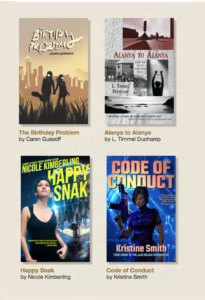 The books in the Feminist Futures bundle really do show a wide range of styles, points of view, content — but what I see common among them is that they show women being themselves, and not a sidekick in someone else’s adventure. Western society at large formally accepts the idea of women’s autonomy, but when it comes down to some of the folks you meet in life — well, let’s just say that there are significant holdouts. We need lots more good examples, lots more engaging tales to be read and loved for their own sake. And when they also promote the idea that a woman as protagonist is perfectly acceptable, even normal — well, that’s helping us create the future, right? 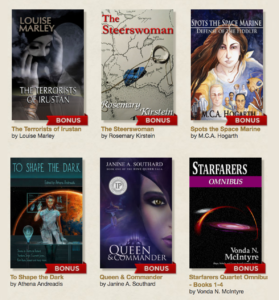 The Feminist Futures StoryBundle is still available for one more week — and then it will be gone!